While the University of Utah offers a variety of dining options on campus, it is still worth exploring the many great restaurants around Salt Lake City. These seven options are either within walking distance or a short drive from the U, and all will satisfy your appetite without breaking your budget. Described as a Vietnamese bistro, Indochine’s extensive menu offers a mix of Vietnamese home cooking, unique gastronomy creations and Chinese dishes. Along with larger entrees, the restaurant serves a delicious array of appetizers, soups and salads, so come hungry and bring friends to split dishes. That way, you can try a little bit of everything. Ugurt frozen yogurt on 200 south below presidents circle. Founded by a U alumnus and located near President’s Circle, this friendly hang-out spot is a student favorite. 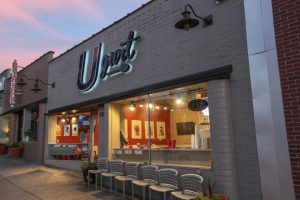 The self-service frozen yogurt bar offers a variety of flavors and toppings, and if you’re in the mood for a drink, UGurt sells hot cocoa and chai lattes. UGurt is the perfect option for a late-night snack during much-needed study breaks since it’s open until midnight Monday-Saturday. This restaurant, named after its chef and owner, is known for its tasty Thai cuisine. A family-owned spot, Sawadee prides itself on spreading the word about authentic Thai food — its website even offers a “Thai Food 101” for newcomers. In 2009, it won the Best of Utah award for Best Thai Restaurant, and Sawadee’s cooking offers something for everyone — the restaurant boasts a wine menu and extensive options for vegetarians. Aristo’s has received local and national attention for its fresh, elegant approach to Greek food. Its menu proves there is more to Greek cuisine than gyros and souvlaki, though executive chef Aristo includes both on the menu. The restaurant is proudly farm-to-table and uses old-fashioned cooking techniques, including growing its own herbs and making cheese and dough in house. At Aristo’s, the menu is both innovative and traditional, leading to Greek food unlike anything else in Salt Lake. Along with the original location near Big Cottonwood Canyon, Porcupine’s site just yards from lower campus has become a massive success, offering a diverse selection of food and drinks designed to satisfy both skiers and students. Porcupine offers everything from pancakes and omelettes to tacos and seafood, and the drink menu includes dozens of options. Try the massive plate of nachos doused with toppings or the baked ravioli served with spinach, breadcrumbs and balsamic. 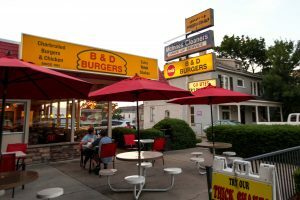 B & D burgers on 1300 East. Since 1981, B&D’s has been a favorite of students and locals alike. The burger joint sells fresh, no-frills burgers for a reasonable price, and after one bite you will understand why B&D is standing room only on most weekend nights. If you’re not in the mood for a burger, B&D serves salads, dinner plates and a variety of sandwiches. Don’t forget to save room for dessert — B&D has more than 20 flavors of shakes and malts. 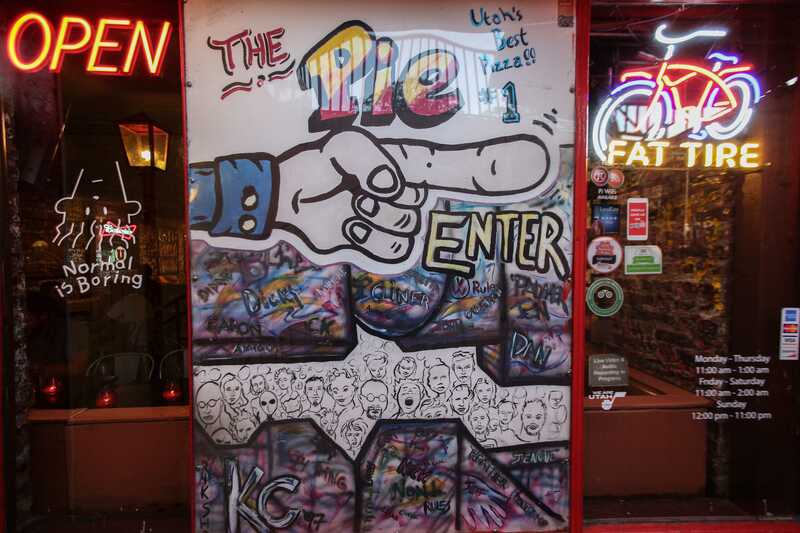 This pizzeria’s basement location near campus is beloved for its distinct atmosphere, where students have left hundreds of signatures on the walls and gluttonous pizza lovers have found their home. Patrons can try one of the specialty pies or choose their own toppings, but rest assured, the end result does not skimp on cheese, or anything else, for that matter. These decadent pizzas are not diet-friendly — but, the restaurant offers vegan and gluten-free options. Love this list! And now Publik Ed’s has joined the scene, with breakfast, burgers (veg & otherwise), salads, tots, etc. And maybe the resuscitated Big Ed’s, now Publik Ed’s, on University Street by Presidents Circle. Good feature in the Trib; look for the story from 8/19 headlined ‘Gawdawful’ breakfast and other reminders of Big Ed’s live on…. You forgot Publik Coffee located at the former Big Ed’s. Great place and great food.